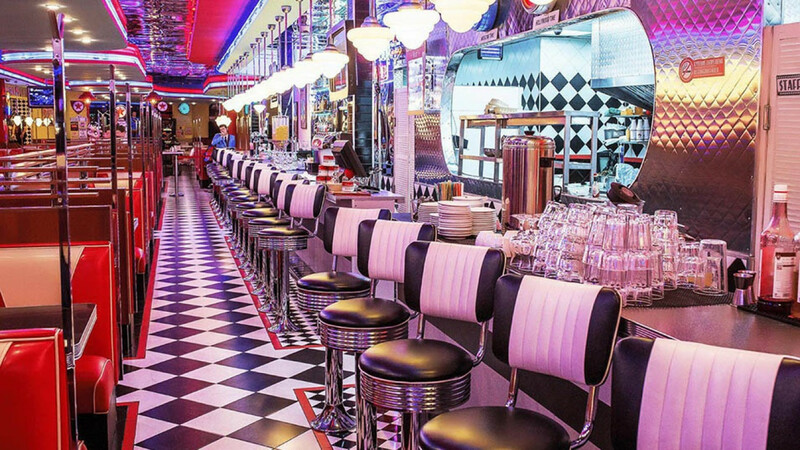 Travel through time and space as you enter Beverly Hills, a true 1950s American diner. 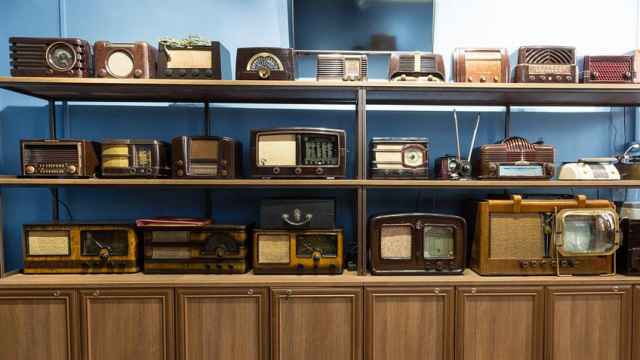 Old movies play on the retro TVs, Sinatra and Elvis hits float from the jukebox and photos of classic Hollywood stars from Audrey Hepburn to Cary Grant line the walls. The menu is almost too long to read, with build-your-own-burgers, over a dozen milkshakes and five separate French toast combos, all just the tip of the iceberg. Not to worry though: There’s more than enough time to try everything that strikes your fancy. 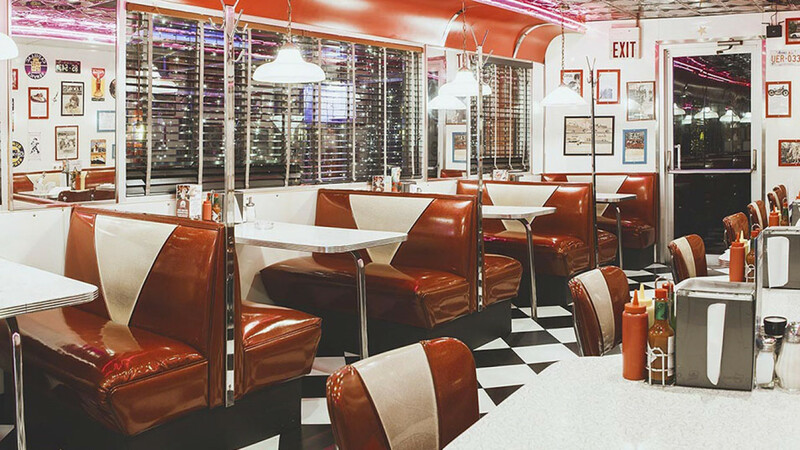 Every diner in the chain is open 24 hours a day, so if you’re in the mood for pancakes at 4 o’clock in the morning, you know just where to go. Find yourself on the streets of California as you settle down for a meal at Pyany Krab i Schastlivaya Kuritsa (literally, Drunk Crab and Happy Chicken). Set up with vintage finds from San Francisco flea markets and the owners’ own photographs of California, the restaurant is as authentically West Coast as they come. Seafood runs the show, as shrimp come in all shapes and sizes, from marinated with mango to shrimp tempura; and crab dishes take it up an extra notch. You can take a crack at a whole baked Kamchatka or snow crab, or get everyone’s favorite, the crab cakes—but if you do, know you’ll be hooked for life. 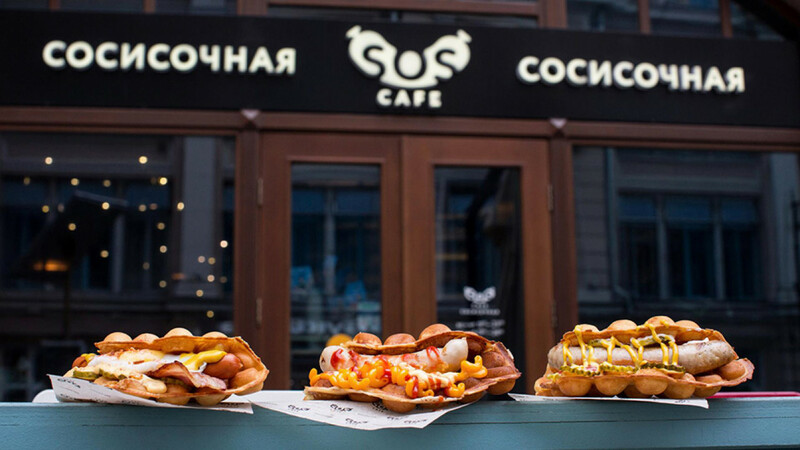 Nothing says American fast food quite like a hot dog, and SOS Cafe has put a whimsical and creative spin on the classic dish. Visitors get a choice of Munich white, pepper and eight other types of sausage; and as for hot dogs—well, let’s just say you’ll get to try something unique. There are four flavors: classic, egg, mac & cheese and pizza, and you can choose to get one wrapped in a Hong Kong waffle. Belying first impressions, SOS Cafe also strives to be accessible for all: In place of sausage, vegetarians can choose to have their meal with carrot, and the restaurant’s fruity beer cocktails are certainly a hit with every customer. An upscale take on the classic American steakhouse, Chicago Grill & Bar aims to deliver the best, juiciest piece of meat you’ve ever had. The elegant, warm interior creates an intimate atmosphere perfect for a date, business meeting or family outing, while those in the mood for a more rowdy evening will feel right at home at the restaurant’s well-stocked bar—a long-time favorite hangout for the foreign business community in Moscow. 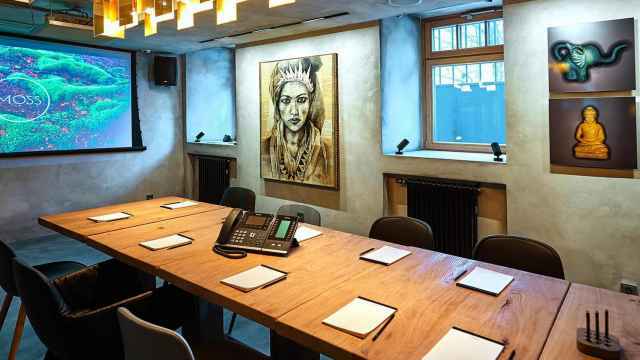 With a remarkable selection of open-fire steaks ranging from the standard filet mignon and rib eye to Chicago Grill’s signature Machete or Denver, the restaurant is a carnivore’s paradise. It has a great wine list too. When the legendary Starlite opened its doors in 1995 as the first diner in Moscow, the city’s inhabitants wasted no time embracing the friendly American joint in all its bagels-and-banana-splits novelty. Over the years, Starlite’s popularity has grown as the diner stretched its ever-evolving menu to include pretzel bun burgers and—with the advent of the World Cup—an all-American football combo, complete with buffalo wings, nachos and tater tots. No one should leave without a taste of homemade pink lemonade. But if you want something a little stronger, try a summer cocktail. Be it a Hawaiian punch or apple pie kvass, you won’t come away disappointed. This place is heaven and even the most discerning Texan would agree. 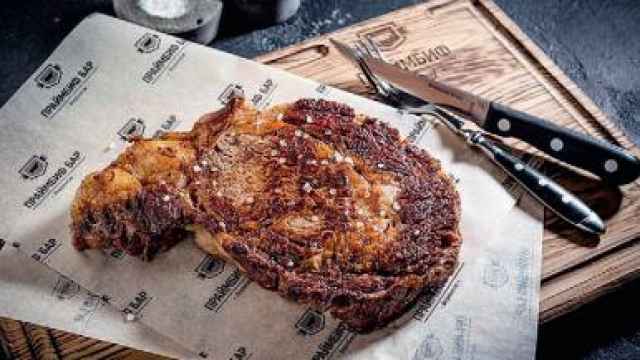 A joint venture by innovative chefs Fyodor Tardatyan and Maxim Livsi along with Arkady Novikov, Moscow’s best known restaurateur, Brisket BBQ brings the cooking culture of Texas into the heart of Russia’s capital. Inspired by Tardatyan’s visits to the Lone Star State, where he got a chance to discover all the secrets of the trade firsthand, the restaurant is a Texan style barbecue: The meat is prepared in a traditional smoker at low temperatures and takes several hours to cook, giving it that unmistakable smoky flavor. Offering an overwhelming array of dishes, from its namesake brisket—a cut of beef or veal from the breast or lower chest—to pulled pork or smoked quarter of duck, Brisket BBQ has something new for each visitor. Once you’ve come in from the bustling streets of Moscow and settled in a booth, the restaurant’s tiled walls and simple modern interior give the impression that you’re actually in the U.S. And even Texan tourists, skeptically entering the restaurant, ready to catch every mistake, end the meal with a glass of moonshine and feeling like they never left home. 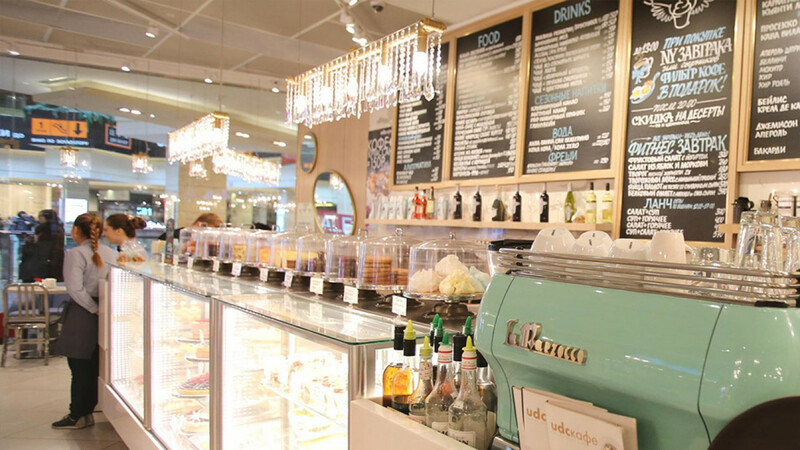 If you’ve got a sweet tooth, there’s no better place than Upside Down Cake Co. to get your fill of American desserts. Cheesecake, red velvet, carrot cake, brownies—this charming café and bakery has it all, and plenty of other treats for good measure. The jewels of the menu are, of course, the Cake Company’s artisanal cupcakes. From the large strawberry and basil or red currant and white chocolate to the bite-sized toasted marshmallow, bursting with flavor, the café’s delicious creations are a pleasure for the senses. If you get there hungry, there’s also a whole menu of standard American fare—just make sure to leave room for dessert. If breakfast is the most important meal of the day, then Tin Woodman is the place to be. Serving all-day American breakfasts and burgers, the staff greets you like an old friend; the cocktails are creative; and the feta burger is to die for. Perhaps best of all, the bar is next door to one of Moscow’s must-see sites: the Moscow State University’s botanical gardens. After a long walk through the exotic plants and flowers, you’re sure to work up an appetite for the deluxe breakfast of eggs, burger, tater tots, toast and jam. Andrei Muchnik contributed to this report.